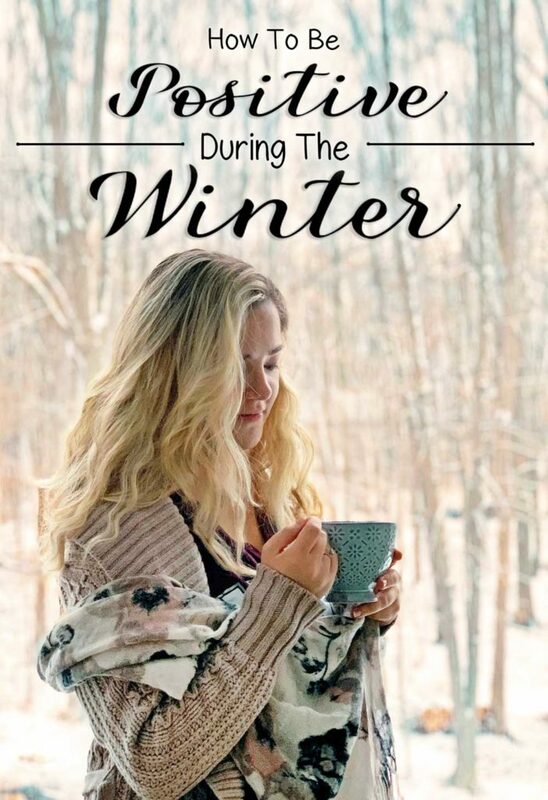 Ask any Northerner for their favorite aspect of winter, and most will likely answer “when it is over.” Though I’ve always been one to love the snow, it’s true that the lack of daylight and constant freezing temperatures can make it challenging to be positive during these seemingly endless months. However, just because you can’t fast-forward to summertime does not mean that you need to sulk until Spring. The good news is that you can beat those winter blues to be positive and happier, even when the weather is less than favorable! 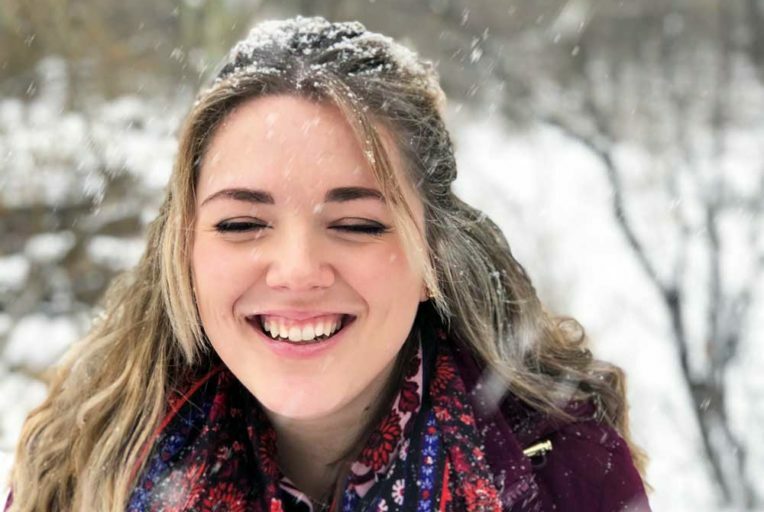 So if you hate the snow, loathe the cold, or just feel plain crabby during the shorter days of the year, follow along below for 20 guaranteed ways to be positive and happier this winter season! This post contains affiliate links, which means we may make a small commission, at no additional cost to the consumer, based off of referred sales. See below for more information. If you seem to feel “blah” this winter, stale, dry air from the furnace may be the root of your winter-woes! Try making a habit of getting outside and taking in some fresh air. Studies show that fresh air is healthy and effective in energizing your mind and body – think of the last time you took a walk through the forest on a crisp morning and the invigorating feeling it left you. Not to mention, if your home is filled with those seemingly-unbeatable winter germs, breathing in some untainted, fresh air may help you fight off colds or the flu. Of course, when you stay healthy, you stay happy and can be positive all season long! As soon as one leaf changes color in autumn, everyone hurries to pull out their fall decor. Similarly, the first time the thermometer reads above fifty degrees in March or April, “Spring Cleaning” seems to go into full effect. During the long winter, decorating with some fun winter trinkets can elicit the same type of buzz and excitement! 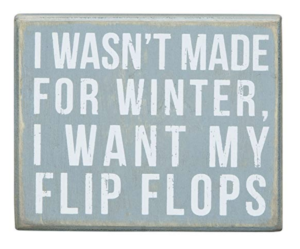 Start by switching up your accent pillows (like this or these), lighting some new winter candles, and setting a few snowy knick-knacks around your home (like this funny winter sign, shown to the right, or this cute one!) Even just adding some cozy textures, like a thick, fuzzy blanket, can warm you up to this chilly season! If you don’t want to buy any new decorations, rearranging your already-owned furniture can add a refreshing feeling of “newness” to your home. It doesn’t have to be a whole-house remodel or anything, but take a few hours one day when you are feeling especially bummed to switch around some decorations, shelves, night tables, area rugs, or accent chairs. Here are some cool ideas to get your inspiration flowing! A small shift from the ordinary can add a rejuvenated feeling to your home, giving you a little boost of joy and fulfillment, pulling you out of a stale winter funk. Okay, so maybe Elle Woods isn’t the most reliable source of information. However, many studies show that even just ten minutes (yes, 10! minutes!) of exercise can drastically increase your mood and help alleviate depression and anxiety. Start small with at-home exercises; one of my favorite ways to burn some calories is dancing in my living room with a YouTube video! For extra motivation to work out in the morning, set out your exercise clothes the night before; it’s one less hurdle to overcome in the morning! The cold temps and dark weather may hinder your desire to get exercise, but if you can just make it through a workout, your body will feel great and your mind will be positive and refreshed! For a lot of people, the lack of daylight throughout the wintertime is a major difficulty. I used to hate driving to work in the dark each morning, sitting in the fluorescent office lights all day, and then driving home again – you guessed it – in the dark. Our bodies need natural light for many reasons, such as increasing productivity and regulating the sleep schedule. Those two things alone can help someone to be more positive, but studies show that outside light is also a natural mood booster! Throughout your day, endeavor to spend some time in the natural light. If you work, take your lunch break outside! If you’re at home all day, make sure to open those drapes and blinds! Another way to increase your natural light exposure during the winter is with a portable natural light box, like this one! This product is engineered specifically to provide our bodies with the light we often lack. Many people have been able to successfully fight a SAD (seasonal affective disorder) by using this light at home or in the workplace. Check it out! Feeling extra bored this winter? 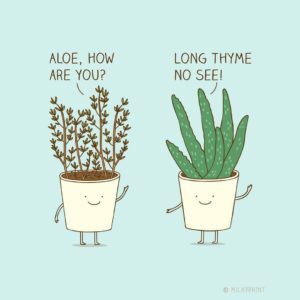 (Pun absolutely intended… LOL!) Why not host a fun game night? Invite a lot of friends, some close buddies, or just gather the family in the living room and blow the dust off those old board games. No matter what game you play, your winter worries will quickly be whisked away, replaced by warm laughter and memories with your loved ones. 7. Be! Productive! Be! Be! Productive! It’s a known fact that we humans are more productive when we’re happier, but did you know it also works the other way around? Yes, in fact, being productive can cause your mood to improve, leading to a more positive outlook on life! Just think back to the last time you finished a big project. Maybe it was cleaning your whole closet, answering all the emails in your inbox, or staining the deck. Whatever the task was, remember the joy and satisfaction that resulted when it came to completion; without a doubt, you felt happy and excited (and maybe a little relieved) that your project was finished. If you want to be happier this winter, why not start (and complete!) a project? It doesn’t have to be large; just attempt to learn something new or finish something you’ve already started. Not only will it detract from some winter-boredom, but finishing your special project will give your mood a boost that just might carry you into the spring! And, if one project isn’t enough, try utilizing a “Productivity Planner” like this one to really get excited about your projects and “to-do”s! During the winter, it may be tempting to cuddle up on the couch and, well, never leave. I get it. However, many studies suggest that socialization actually can cause us to be healthier. While this may be surprising, the psychological and physiological effects of being social can reduce chronic stress, subsequently lowering many adverse conditions. And, when your health is in good shape, you naturally just feel happier. This doesn’t mean that you have to be a “party animal” every night of the week; some people do need “me-time” more than others. Nevertheless, in order to be positive throughout the winter, try to make a concerted effort to spend a little more time with friends or family, and a little less time hibernating alone. Just as the summertime is synonymous with certain activities (swimming! cook-outs! bonfires! ), the winter brings its own season-specific hobbies. Why not try to take advantage of these winter-exclusives, like sledding, snow-tubing, tobogganing, building a snowman, having a snowball fight, or skiing? Don’t let the kids have all the fun; adults can find some unexpected joys in these nostalgic moments, too. It’s much more challenging to be positive when you are uncomfortable, especially if you are suffering through repeated bitterly cold, wet days. To stay happy and be able to see the positive sides of winter, make sure to check the weather forecast in advance and dress accordingly! It may be easy to just grab any coat and run out of the house without another thought, but being prepared for the winter elements will keep you warm and help you to enjoy the season more! 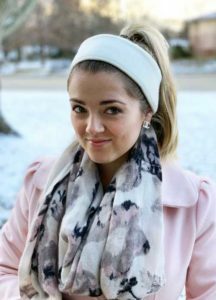 A large scarf; I never leave without one, just in case the office, restaurant, etc. is drafty and cold! Fingerless mittens or technology-friendly gloves. Nobody likes cold hands! Fleece-lined leggings are great if you spend a lot of time outside, or need to dress-up often! They are my MOST favorite winter accessory – I can’t live without them. You can even wear a pair under jeans for extra warmth and softness on the coldest days! Be sure to stock up on fleece socks during the winter; wear them with boots, regular shoes, and even just around the house to keep your toes-ies toasty! It may be so tempting to turn to “comfort food” for some solace on a depressingly cold day, but a diet lacking in vitamins and minerals can actually make you feel worse! Make an effort to trade the carb- and sugar-heavy treats for lighter, fresher options that will help your body stay healthy and strong! For example, instead of creamy rice and pasta dishes, use some veggies as a base (like zucchini noodles) and top with a light marinara sauce! Endeavor to use fruits and/or vegetables at least once in every meal to give your body the nutrients it needs. Utilizing frozen produce is an easy and budget-friendly way to eat healthier even when the fresh grocery store pickings are slim. Check out some of my favorite healthy recipes here to be positive and happier this season! I’ve always embraced the idea that less physical clutter directly decreases the amount of “mental clutter” you have. So, if you are constantly feeling frustrated this winter, make it a habit to take a few minutes at the beginning and end of each day to tidy up your commonly used areas, like the office, bathroom, kitchen, or car. One way to keep organized is to give every item a “home”, or a place to go. I love to use small plastic organizers so I know where to put something once I use it, reducing annoying frustration and hassle when searching for your belongings. I have multiple versions of this organizer for my makeup, nail polish, creams, and accessories storage, and this for holding my earrings. I’ve also used these organizers for larger bathroom items, as well as office and certain kitchen storage. For even larger items, I use these hanging organizers; I have one in every closet of my home for crafts, shoes, clothes, scarves, and cleaning storage, too! Decluttering fosters an undeniable mental state of tranquility. Consequently, when your mind is clear and calm, your entire attitude will be positive. Therefore, you can continue living each day with a happy outlook – this winter and beyond! Self-care is one of the topics that seems to be inescapable right now. Hundreds of Pinterest articles pop up on my feed daily offering ways to preserve and improve one’s mental and physical health. The simple truth is that we all need to take care of ourselves, especially if we are in a position of frequently giving to others. Trying spending some “me-time” for just a few minutes every day, doing something that really treats you. It may be different for everyone, but I love to use this neck massager, drink a cup of wellness tea (this brand is my FAVE), and paint my nails! It’s a simple, but effective treatment that I look forward to daily. Giving yourself some quiet, selfish minutes alone helps to relax your mind and body, reducing stress, and, consequently, helping you to be positive and happier! Having fun with a new social activity will erase any negative thoughts of winter from your mind, and maybe you’ll even find a new hobby! When life gives you lemons… well, you know how it ends. One of the most common cliches out there can make the biggest difference in your mental well-being! Irritated that you have to scrape the ice off of your car after a storm? At least you have a car to take you to your destination. Hectic day at work? Be thankful you have a job to provide for your family. Barista make your coffee order wrong? It’s just a drink; plus, you have the privilege to order another at any time! Instead of letting numerous negative thoughts weigh on your mind and diminish your positivity, stop and adjust your viewpoint; your newfound happiness will no doubt make a difference in your life, and those of whom you affect, too! One of the first Bible scriptures I memorized as a young girl was Acts 20:35 where it says, in part, “There is more happiness in giving than there is in receiving”. So follow the timeless advice, and, if you want to make yourself feel better, try doing more for others! Prepare a meal or baked goods; here is one of my favorite cupcake recipes, or a neat cookies-in-a-jar gift! Send a “thinking of you” card with a sweet message, funny joke, or old memory inside. Bundle up and unexpectedly shovel their driveway or brush the snow off their car! Call (yes, call – you know, on the phone) someone with whom you have fallen out of touch. Buy an extra cup of coffee or tea for your doorman, secretary, boss, or children’s teacher. Making small, kind gestures for important people in your life is a phenomenal way to unselfishly increase your daily joy. Not to mention, when you unexpectedly do something nice for others, the happiness is contagious – just think of how many lives you can brighten! Though it may be tempting to sleep in as late as possible when afforded the opportunity, cultivating a regular sleep schedule is important to keep yourself feeling sharp and focused! 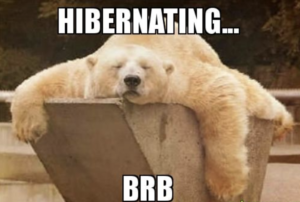 In fact, many studies confirm that an inconsistent resting pattern can lead to irritability, sluggishness, and even decreased cognitive skills! To train your body to a certain sleep schedule, pay attention to when you naturally feel like falling asleep and waking up; whether you are an early riser or a night-owl, make sure you are achieving around 8 hours of sleep each night. Once you’ve nailed down your ideal bedtime, stick to it! Eliminate any distractions that may keep you up – I’m looking at you, iPhone! If you feel you need some extra help staying asleep, try listening to a white noise soundtrack or playing a restful sleep recording on the TV (only one with low blue-spectrum light, of course!) Max and I always play an oscillating fan sound on loop if we are staying somewhere overnight while traveling! Getting a good night’s rest will no doubt leave you feeling energized the next morning, which will help your efforts to be positive and happy throughout the day. Bundling up with warm winter layers helps you keep more comfortable outdoors, so why stop there? Make your home a warm solace from the chilly weather to create a cozy, relaxed environment that will foster a contagious positivity! Wear a pair of cute, fuzzy socks or memory-foam slippers. Bake a meal instead of using the stove – the warmth from the oven and amazing aroma are unbeatable! Stock up on knitted blankets for each room in your home. Utilize thick, insulating curtains to keep cold air out! Consider purchasing a humidifier to ward off annoying winter static. Dim the lights to create a moody ambiance! The nature-y plant trend isn’t just popular for looks right now; did you know, plants actually purify the air we breathe AND can reduce stress? The latter part was fresh news to me! So, to feel more positive and happy this winter, spruce up your home with some plants! Even if you think you have a “black thumb”, don’t be discouraged; this article has some great tips for cultivating plants as a beginner. One idea for a new “plant-parent” is to begin with succulents, because, frankly, they are difficult to kill. Most only require a small amount of water (good if you are forgetful) and can remain pretty hearty, even in a dry (winter!) atmosphere. Eat plenty of natural produce, which is full of vitamins and minerals (AKA nature’s medicine.) The USDA recommends taking in around 7-9 servings of fruits and vegetables per day, which will give you plenty of immune-boosting nutrients! You can also drink tea to fight germs; herbs have long been sought after due to their powerful physical effects. Peppermint, ginger, echinacea, rooibos, lemon, and rosehip are all good ingredients to look for in regards to staying healthy during the flu season. Get proper sleep and exercise. These topics were discussed earlier (#4 and #17), but studies also indicate that a good night’s rest and moderate exercise can boost your immune system functions, and increase your body’s effectiveness at fighting off any germs to which you may have been exposed. Remember what Mom always told you upon arriving home; “Wash your hands!” One of the most effective ways of avoiding illnesses is to not expose your body to bacteria and germs in the first place! Hence, wash your hands properly before and after the following activities: eating, drinking, touching your or someone else’s face, preparing or serving food so that you don’t bring germs and bacteria into your body. Coming off of the tail end of washing your hands, it’s important to also take care to clean your daily belongings. Think about the most touched items in your home, like keyboards, door/refrigerator handles, countertops and surfaces, and your cell phone! Take time each day to clean these areas with an antibacterial wipe to kill any germs that may be lingering. Think about it: you shake someone’s hand, and then immediately answer a phone call. You later sanitize your hands, but germs may already be lingering on your phone! Should you then use your phone again later, say, as you’re eating, you may be unknowingly subjecting your self to any germs contracted by your hand-shake earlier! In fact, the NHS has found that some cold-causing viruses can live on indoor surfaces for up to seven days! What a messy cycle. Following these tips carefully will ensure that you and your family can stay flu-free this winter season – and on into the warm weather, too! 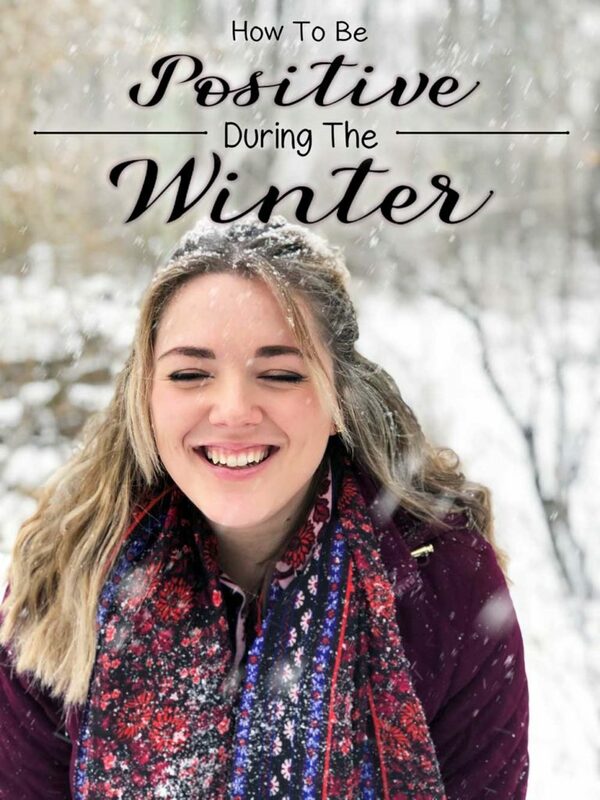 You Can Be Positive And Happy This Winter! The coldest months can be tough. And, sometimes, they feel as if it lasts for ages. So, don’t be too hard on yourself if you are feeling a bit down this season. Just take baby steps to implement the easy tips above and you will find yourself becoming more positive and happy – throughout the winter, and beyond! Have any additional tips for fostering a positive mentality? Leave me a comment below; I’d love to hear what helps you! Don’t forget to find me on Instagram so we can keep in touch, and enter your email below to receive notification of my next blog post like this one. Signing off with wishes for a warm and happy winter season! I grew up in a tropical climate and I can attest to the effect of winter or cold weather on the persons mood and feelings, it is definitely important to try and purposefully add things that bring you joy. My dad and I go skiing every season and those days are some of the best days of winter. We go to a resort that has an amazing view of Mt. Rainier when it’s a clear bluebird day, though no matter the weather I always end up taking a lot of pictures even if the mountain isn’t out. These tips are so good — and not just for winter. Some of them are applicable all year round. I’m totally bookmarking this! Also, I just wanted to point out a tiny typo for you! It’s so funny to me that get fresh air was at the top of your list. I’m trying to bundle up and get a short walk every day. It makes such a difference in my mental state! I have been seeing this meme going around on Facebook about today being the 74th of January! I have to laugh because it really feels that way. I am in Missouri and we have had some warmer winter days but for the most part, it has been downright cold! I think the whole family is starting to feel cooped up and all of our emotions are on high. I think we need something to brighten the place up, maybe I will go ahead and get some of my springier decor out! Yes! I’ve been seeing the same one! It’s so true. I am from Ohio and it’s supposed to be single digits all next week.. oh boy!